The video game World of Warcraft and the most transformative technology of our time share a common story. Like many teenagers, Vitalik Buterin invested a considerable amount of time playing the popular video game before “tragedy” struck. After three years of intense play, a centralized server change destroyed Buterin’s game and led him to leave the platform. Of course, this wasn’t a real-world tragedy, but it was the catalyst for some of the most profound technological innovations that are altering nearly every industry and are likely to impact nearly every person on the planet. You can be forgiven for not knowing who 23-year-old Vitalik Buterin is because he isn’t a household name – yet. His best achievement to date, Ethereum, is just making its foray into the mainstream narrative, so his name alone has yet to evoke the same reaction as other tech visionaries like Bill Gates, Steve Jobs, or Jeff Bezos. However, Buterin’s primary work developing the Ethereum blockchain is already changing the world, and it’s poised to be the definitive blockchain technology for the foreseeable future. Buterin was born in Russia, and his family moved to Canada when he was three years old. His academic idiosyncrasies are well documented, including his early promotion to advanced placement courses, his ability to mentally add three-digit numbers at twice the rate of the average human, and his early preoccupation with the preeminent cryptocurrency, Bitcoin. Vitalik sitting near the president of Russia, Vladimir Putin, at International Economic Forum in 2017. Buterin’s father Dmitry, a computer programmer, introduced him to Bitcoin when Buterin was 17 years old. He’s a college dropout, a political activist, and a brilliant developer. The combination of strong personal convictions and academic excellence initially resulted in a social isolation that led Buterin to spearheading the development of one of the most promising technologies on the planet. In doing so, he has asserted an influence that rivals experts who are decades his senior. Through his work with the magazine, Buterin would extensively cover different aspects of the burgeoning currency, and he would travel the world to spend time with various cryptocurrency projects. These meetings revealed an entire community of people who were developing services around Bitcoin and its underlying framework, blockchain. Convinced of cryptocurrency’s usability and practicality, Buterin identified a shortcoming in their pursuits. Through his work with the magazine, Buterin would extensively cover different aspects of the burgeoning currency and would travel the world to spend time with various cryptocurrency projects. These developers were too focused on Bitcoin’s singular approach to cryptocurrency, which primarily facilitated p2p transactions. Buterin saw the blockchain as a transformative tool that could improve almost anything by making it more cost-effective, more efficient, and more transparent. From that point forward, Buterin shifted his attention from Bitcoin and began developing Ethereum. The blockchain is a decentralized ledger that records information and enables smart contracts; its proliferation can primarily be credited to Buterin. The Ethereum white paper was published in 2014, and it marks the beginning of the Ethereum blockchain, which greatly expands the purpose and possibility of the technology. Buterin has strong political beliefs. In an interview with Wired, Buterin asserts that he “saw everything to do with either government or regulation or corporate control as just being plain evil.” He goes on to explain that his political views have progressed some, though there are clear connections between this worldview and the underlying philosophy of Ethereum. It’s intended to be a disrupter and a game-changer for anyone and anything that can develop on its platform. Vitalik speaking at the 2017 TechCrunch Disrupt conference, explaining that Ethereum will be able to match Visa in transaction capacity within a few years. Nearly every major trend in cryptocurrency is in some way linked to Ethereum including the rise of ICOs, the broad expressions of tokens, and the fintech movement in finance – all of which are made possible by Ethereum’s blockchain technology. Moreover, decentralized applications are restructuring whole workflows like finance, cloud computing, and messaging. The Ethereum blockchain is Buterin’s magnum opus, but it’s nowhere near finished. Its value has risen more than 2,000% this year because developers, institutions, and governments are beginning to explore the platform as the way to modernize their operations for the next century of development. Buterin and his team are hard at work potentializing advancing the blockchain toward its best version of itself. In the meantime, Buterin continues to provide his expertise to the cryptocurrency movement in general and to Ethereum in particular. Zug, Switzerland, a.k.a. 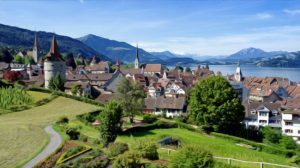 “Crypto Valley.” Home to the Ethereum Foundation and many other blockchain companies. Buterin is an active developer at the Ethereum Foundation. He maintains a high-profile role that steers the direction of Ethereum while also serving as part evangelist and part professor on the nature and possibility of cryptocurrency. It’s uncertain what cryptocurrencies will look like in ten years, but Vitalik Buterin will be at the forefront of that discussion, advocating for decentralization, transparency, and progress. 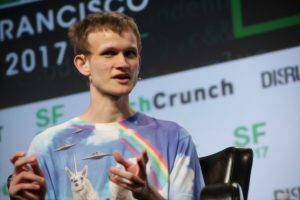 Instead of playing World of Warcraft, Buterin is building a real world of his own, and this time it’s not likely to fail. If you’re interested in learning more about Vitalik and Ethereum, check out this video from September 2017 where Vitalik is speaking at TechCrunch Disrupt.